January 9, 2018 - Irvine, California - Skyworks Solutions, Inc. (NASDAQ: SWKS), an innovator of high performance analog semiconductors connecting people, places and things, today introduced Sky5™, its suite of solutions that will support 5G wireless communications and enable a multitude of new and previously unimagined applications across mobile and Internet of Things (IoT) ecosystems. With decades of experience in developing innovative connectivity platforms for each previous generation of wireless standards, Skyworks is leveraging its vast technology portfolio, systems expertise, leadership scale and strong customer relationships to accelerate the deployment of 5G. More specifically, Skyworks' Sky5™ solutions encompass its highly innovative transmit and receive systems targeting the world's most demanding wireless end markets. "Today Skyworks introduces our breakthrough Sky5™ platform, enabling the next-generation of wireless communications," said Liam K. Griffin, president and chief executive officer of Skyworks. "5G is a macro-economic game changer that will revolutionize the global communication landscape with significantly more powerful and complex connectivity engines. As a leader in unwiring the planet, Skyworks is well-positioned to capitalize on the demand for robust and dramatically increased data transmission speeds with near zero latency - key features that are mission critical in powering new usage cases from autonomous vehicles to emerging segments in artificial intelligence, robotics and virtual reality. Our Sky5™ solutions will address new 5G waveforms and spectrum, enhanced carrier aggregation, dual connectivity (4G/5G) and massive MIMO requirements while delivering unmatched levels of integration and performance, all underpinned by Skyworks' intellectual property, operational scale and financial strength." According to a May 2017 Research and Markets report, the very first standardized deployments of the technology are expected to be commercialized as early as 2019, with the 3GPP's standards organization initial 5G specifications set to be implementation-ready by March 2018. Between 2019 and 2025, the 5G network infrastructure market is expected to aggressively grow at a compounded annual growth rate of nearly 70 percent, eventually accounting for $28 billion in annual spending by the end of 2025. 5G is the term used to describe the next generation of mobile communications beyond today's 4G LTE standard. It embraces a revolutionary paradigm shift in wireless networking and will support groundbreaking throughput speeds (up to 100x faster than 4G), low latency and scalability for future usage cases that require extreme bandwidth including autonomous vehicles, augmented reality and the billions of machine-to-machine and IoT connections. To put this in perspective, according to Intel, by 2020 a single autonomous car is expected to consume 4,000 gigabytes of data per day in real-time diagnostics, positioning and vehicle to vehicle communications – that's equivalent to the daily data consumed by more than 2,000 smartphone users in 2017. Downloading a full-length HD movie in 3G took one day, in 4G, the same file took minutes. On a 5G network, this content will be downloaded in mere seconds. 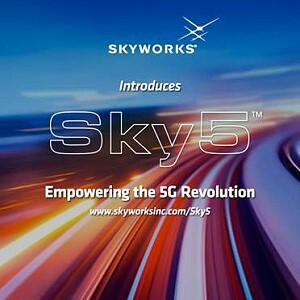 All of Skyworks' devices and system solutions supporting 5G will be included in the Sky5™ family. This will include an unprecedented suite of highly flexible and customizable architectures and devices that provide breakthrough performance, footprint and power efficiency. To learn more, please go to www.skyworksinc.com/Sky5. SSkyworks will be hosting meetings at CES in the Las Vegas Convention Center, South Hall, Meeting Room MP25756.